I love this case! It's my first Otterbox! I brought it for my new iPhone 7 (Rose Gold) and it looks so pretty! I love the design of the case and the way it hugs my phone. I don't have to worry about the protection of my new phone and it looks cute! I love the purple and pink design on the back. I also love how the case comes with a screen protector built in and a holster! This was a great purchase. I'm just hoping that the case lasts for a long time & continues to protect my phone, especially because I'm extra careful with it! 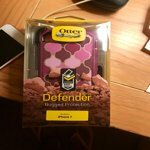 I have always trusted otterbox with my iPhone. Recently traded in my iPhone 5 I had for 3 years (had an otterbox the whole time). Now I have one for my iPhone 7. I've already dropped my phone several times and the case has protected it. I certainly would recommend! This case is a great protector for my iPhone. The other cases Ive purchased were nice to look at, but never truly protected the cellphones because I wound up with shattered screens. However, the otterbox defender is working out just fine. Great product!